Manchester City is one of the largest and busiest cities in the UK and this is why you have to learn one or two tricks to survive such as knowing where you can get auto locksmith Manchester services when you need them. This is the third most visited city in the UK which means that any time of the year, you can expect busy streets and traffic jams. This sort of confusion is a perfect brewing port for many automotive problems including problems with the locks and keys of your car. Knowing the best auto locksmith company to get in touch with under such conditions can save you a lot of time, money and unnecessary inconveniences. Auto locksmith Manchester is one of this great cities most reliable names when it comes to matters to do with car locks and keys. We provide our services to both the city of Manchester and the areas around it to ensure that anyone close enough to the city always has a reliable locksmith to call on at any time. Whether you are new to the city and don’t know about an auto locksmith or you’ve been driving around these parts for a while and are dissatisfied with the work of your current auto locksmith, we will give you a chance to experience what it’s like to have a competent locksmith working on your car locks and keys. There are many lock and key related problems that we’ve been called upon to fix in the past but one of the main things we do for drivers is providing them with Replacement Keys. 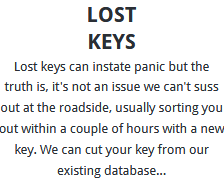 Whether you don’t feel your key is secure enough and would like a spare or whether you want more than one key for the vehicles in your fleet, we will have you sorted in no time. 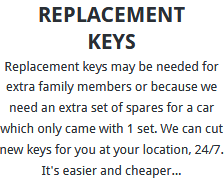 We are also regularly called by customers with Broken Keys who need the keys replaced or would like some help removing the broken part of the key from the lock. 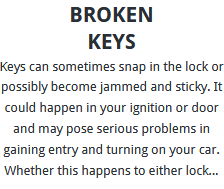 In this situations we have just what is needed to quickly and cleanly remove the broken parts of the key and even inspect the lock or ignition to see whether the same thing may happen again. In a city as busy as this, incidents of people misplacing their keys are far from few. Sometimes, you may be feeling distracted and end up leaving your key on a restaurant table while on other occasions you may even be the victim of potential car thief looking for an easy way into your car. When you lose your key, we can have a new one ready for you in no time and we’ll even do the necessary Transponder Programming to ensure that your car is secure even if your keys are in the wrong hands. Call us today for more information on our services. When you need car locksmith Manchester services, there is one company that you can rely on to get on top of the situation if you’re driving within or near Manchester and that is Auto Locksmith Manchester. The reliability of our services is as sure as our company name and we’ve spent many years in this city providing our services to motorists who need them. Whether you’ve had bad experiences with auto locksmiths in the past or you’re just unsure of who you can trust with fixing the lock of your brand new Porsche, we can guarantee that our services will be exactly what you need and nothing less. A frequent issue with some auto locksmith companies is their inability to keep up with lock and key requirements of cars as new models roll off the production line every year. Only a company that has invested in specific resources can keep track of all these car models and ensure that it still has what is needed to provide these vehicles with the auto locksmith services they need. In Manchester, the company that has done all this is Auto Locksmith Manchester. We view our company as something that is there to last and thus we invest in many emerging solutions in the automotive industry that touch on vehicle security including new lock and key types. 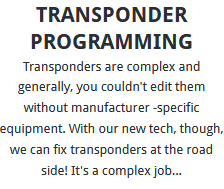 This dedication to keep things fresh and to stay abreast of all the changes in the industry has made our services reliable to both old and new vehicle owners. Car manufacturers are now also using certain proprietary systems in an effort to improve the security of their vehicles. This is especially common among luxury car manufacturers since these vehicles are the common targets for most car thieves. This proprietary security technology will be a problem for many auto locksmiths to deal with in case the owner of the car has somehow locked themselves out of their own car. Luckily, in Manchester you always have Auto Locksmith Manchesterand our locksmiths can always be called upon to act decisively even in such situations. Imagine losing or breaking your key and it’s the middle of the night and your brand new Mercedes Benz is parked in a part of town that doesn’t look too friendly. If you call just any odd auto locksmith, you may be wasting your time on someone who hasn’t got the slightest idea how to handle the security systems in these new vehicles. This not only wastes your time but also puts you and your vehicle at risk. We provide motorists in all parts of Manchester with 24-hour emergency services to ensure that we can be there for you whenever you need us. Our quick response time limits the amount of time you have to spend worrying about where you are and whether you’re safe. All Rights Reserved © 2018 Auto Locksmith Manchester.